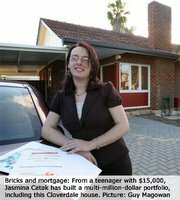 While the property boom has left most 27-year-olds struggling to save the deposit for a first home, young Perth woman Jasmina Catak has amassed a $1 million profit from her portfolio of seven houses. Her properties are valued at about $2.5 million and she hopes to be able to stop work within a few years. Miss Catak, 27, of Rivervale, has a degree in commerce but her business ventures were inspired by a former boss and real estate agent. “He encouraged me to become involved in property investment and I found once I started it actually worked really well so I just kept going,” she said.